Paul Buck (bucky1233) and Steve Boxley (boxst) two of our regular forum members and both behind the www.broadbandmap.co.uk website met Ben Verwaayen the BT CEO last week at BTs London HQ. The meeting was the result of a chance email from Paul to Mr Verwaayen asking about the new demand lead rollout and what prospects there was for a rollout of ADSL in the Penrith area. Full details of the meeting can be found in Penrith's Cumberland & Westmorland Herald – a scan of which is available here (280KB ). While the meeting hasn’t resulted in direct action yet for Penrith it has helped to highlight the issues for the area and given any campaigning in that area a large boost with plenty of media coverage. 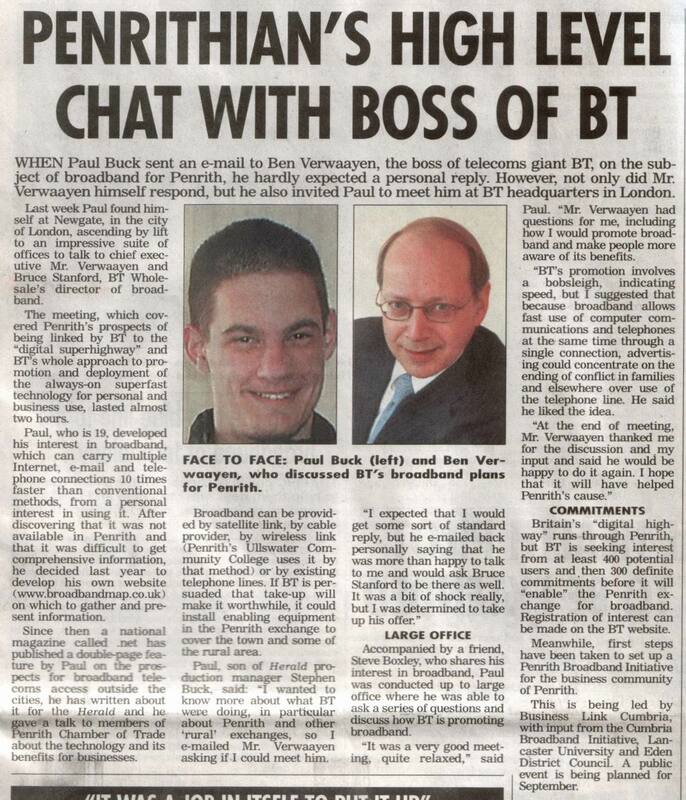 The meeting also shows that Ben Verwaayen is serious about wanting to communicate with BT customers and to actually find out what is happening at the grass roots level – rather than just what middle management and the media tell him.